The Center for Manufacturing Technology consists of two sections: the Manufacturing Technology Section and the Thermo-Engineering Test Section. The Center has a total floor area of 1,700m2 and was established as a common use facility for the College of Science and Technology. The Manufacturing Technology Section has a floor area of 596 m2. Facilities and equipment include the CAD/CAM, electro-mechanical devices, manual and/or NC machine tools, and various equipment for welding and casting. These can be utilized for preparing, designing and manufacturing experimental equipment as well as for construction practices of students. 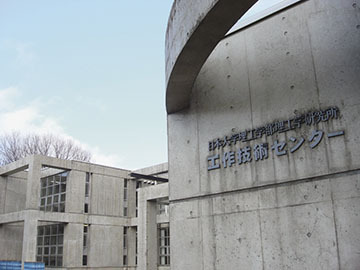 These facilities are available for use not only by the Nihon University community but also by other students and/or organizations not affiliated to the University. The Thermo-Engineering Test Section has a floor area of 680m2. It has five independent test rooms, consisting of experimental rooms and measurement rooms. Study and research on engine combustion are carried out in this facility.